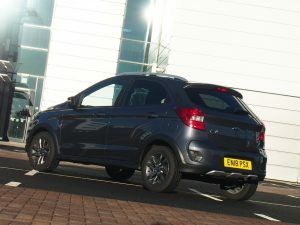 Folk who complain about the Ford Ka being too small need their butts kicked and that includes certain journalists who write about motoring – as opposed to motoring journalists who write about cars. If you want more room, buy a bigger motor. If you need more interior space then you’re looking in the wrong place, don’t criticise small cars. 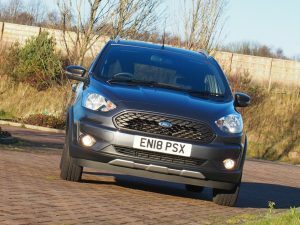 Step up to the Fiesta, Focus or Mondeo, or if you need to make a statement, try the Ford Edge, and of course there’s a whole range of models in between. In other words, don’t criticise a small car for what it does well. This being the latest Ford Ka+ it has five doors while the ‘Active’ tag makes it sit taller in the road. And that’s not just a gimmick. The old guy in the corner house at the end of our street finds it noticeably easier to get in and out of than the standard Ka, that’s because it sits 27mm higher. It might only be an inch but apparently it makes all the difference to a chap with athritic knees. Also, small dimensions make it the ideal commuter. Of course there are those who want to travel more widely and perhaps do a bit of touring or go on holiday with it. Such buyers will therefore need to carefully consider what they want out of motoring life. If you want a wee car then that means compromise, but for the many thousands who opt for the Ka it does the job admirably. The power output from the 1.2 litre 4 cylinder is pretty modest at 84bhp, but it’s still fun to drive. The 0 to 60 time takes over 13 seconds although it actually feel nippier than that because it’s such fun to play with that sweet little five speed gearbox. 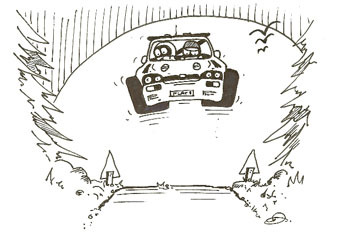 If you have a good handling car then you don’t need to drive fast to have fun these days. The car has adequate room for four folk, or five at a squeeze, and a decent sized boot. It looks good and it’s well finished. In fact the only thing that could be criticised is the price. 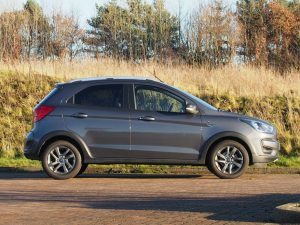 Although the Ka+ range starts at just over 11 grand, this ‘Active’ model cost nearly 2 grand more while the 1. 5 litre diesel option adds another thousand quid on top of that. When the first Fiesta was launched way back in 1976, the 41 hp 1.1 litre version cost just over £1800. Changed days eh, but then again, the same could be said of any motor manufacturer these days. Having said all that, the Ka+ does come well equipped and complete with one of those stand up tablet-style touchscreens in the centre of the dashboard. That gives access to a whole load of functions and options such as Ford SYNC 3 with a DAB radio and emergency assistance with Apple and Android access. It also has 2 USB sockets, air-con and privacy glass. 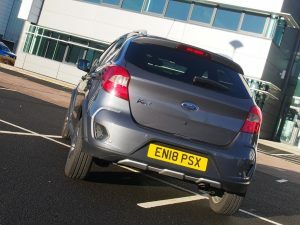 The car also comes with Ford’s smart ‘MyKey’ facility which allows the owner of the car to set limits for other drivers – ideal if letting junior loose in it once he/she has passed his/her driving test! It has a speed limiter and Hill Start Assist and of course ESP. It also has a Tyre Pressure Monitoring system. In other words, you get a lot of small car for your money. It also looks the part sitting high on its 15 inch alloys with plastic wheel spats and roof rails. So I don’t care what anyone else says, I like it, and I’m a big bloke.